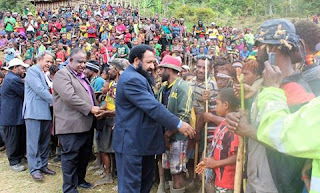 The PNG Opposition wants the country’s most-isolated districts connected to the rest of the provinces, Opposition Leader Don Polye told a crowd in Wabag’s Maranumi yesterday (Friday). Mr Polye said there were four districts in PNG lacking road links, adding they are Pomio (East New Britain), Karamui-Nomane (Chimbu) Telefomin/Oksapmin (Sandaun) and Maramuni (Enga). “Our alternative government’s policy is we will budget K300 million to link all these areas to the rest of the country,” he told a cheering crowd. He said even if he didn’t form the next government, he would still honor the commitment as a Kandep MP. He stated of that Pomio and Telefomin/Oksapmin would get K50 million each whilst K100 million each will be received by Maramuni and Karamui-Nomane. Polye said most of the road projects were polarized in urban areas only, citing billions of taxpayers’ funds were ‘wasted’ in Port Moresby alone at the expense of these areas. “The flyover in the nation’s capital cost over K300 million. If the government had funded these roads, our rural people’s livelihood have been improved. He said when he was a Works Minister in the past government, he gave K10 million for the construction of Maramuni road, which is still incomplete. Polye was in Maramuni to launch an alluvial gold mining association. He arrived there with his delegation to a hero’s welcome.